Disney Auctions (P.I.N.S.) 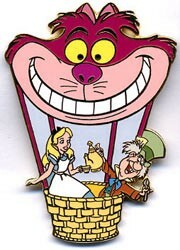 - Cheshire Cat Hot Air Balloon Alice and the Mad Hatter enjoy an airborne tea party in a Cheshire Cat-inspired hot-air balloon on this gold-finished pin, one in a series of character collectibles. It's a Disney Auctions exclusive in a limited edition. This picture is Courtesy of pinpicks site. MATERIALS hard enamel SIZE: approx. 1.625" x 2.25"